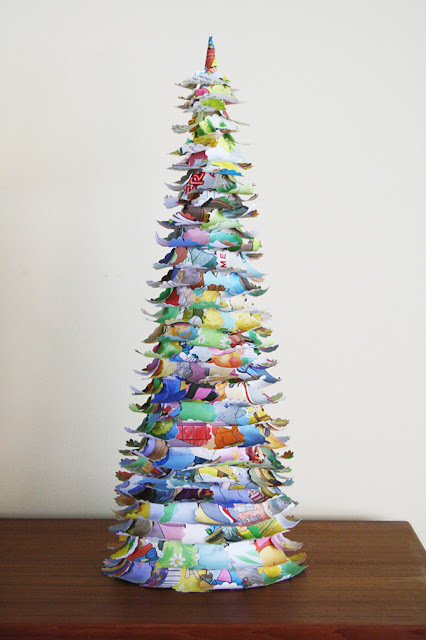 When I found this paper tree tutorial over on the Crate Paper Blog, I knew I had to give it a try. 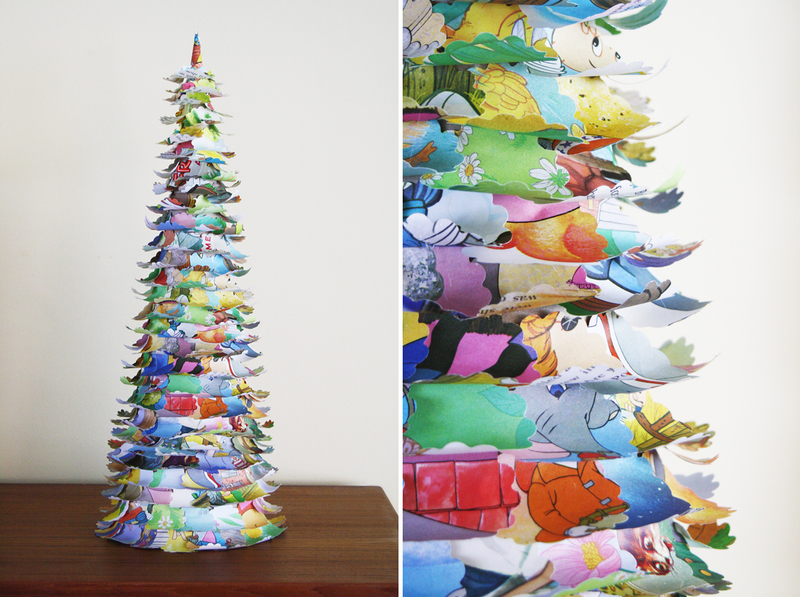 I decided to use pages from old children's books to give the tree a bright, cheery look. I really love how it turned out. Here's how to make your own! Form a cone out of your poster board or cardboard and hot glue it into place. Find colorful pages in the children's books and punch out some circles. Wrap the circles around a pencil or pen to curl them. Start at the bottom of the cone and hot glue the curled circles in rows. Make sure the rows are somewhat close so that the cardboard doesn't show. Once the cone is completely covered, form one circle into a cone shape and hot glue it to the very top. That's it! holy crap!! this is freaking amazing!! it looks like it took a lot of time but the finished product is incredible and so cute! it'd be awesome in a childrens room, all year round. also, hi!! i'm carly :) i checked out your awesome vintage shop and cute paper goods shop from srslyliz and since i liked both of those so much, i thought i'd stop by your blog and say hello as well! This is such a great idea for other rooms without a Christmas tree! Thank you all! And yes, I completely agree, this tree is perfect for rooms without a Christmas tree or since it's so colorful, you could display it year round!